TV with Thinus: BREAKING. SABC chairperson Zandile Tshabalala rips South Africa's print media; says 'people in this country vilify the SABC'. BREAKING. SABC chairperson Zandile Tshabalala rips South Africa's print media; says 'people in this country vilify the SABC'. The SABC chairperson Zandile Tshabalala is ripping into South Africa's print media, saying print media writes negatively about the SABC because the SABC is "competition number one" for print media and that "people in this country vilify the SABC". Zandile Tshabalala is also slamming independent auditor PricewaterhouseCoopers (PwC) and blames Apartheid era tests for the SABC's dismal skills audit report done by by PwC. Zandile Tshabalala was interviewed by Mpho Tsedu, the presenter of Question Time, the daily talk show on the SABC's own 24-hour TV news channel, SABC News (DStv 404). Zandile Tshabalala's interview follows after a scathing skills audit report from PwC from July 2013 on the SABC, which was revealed in parliament on Tuesday as the SABC CEO Lulama Mokhobo, the 6th CEO in as many years at the public broadcaster decided to quit. Members of parliament's portfolio committee on communications called the report and its findings "shocking", "disconcerting", "very worrying" and a "reality check" for the SABC. "The demeaning statements that SABC officials can't think is totally unacceptable," said Zandile Tshabalala. "But its print media. What can you do?" "We are working together to give shape to most of the problems at SABC. But its not all doom. There is very good work that SABC has done," said Zandile Tshabalala. "People in this country vilify the work of the SABC employees. There's a lot we have to question about this country about how patriotic are we? And whether or [not] we want SABC to strike." 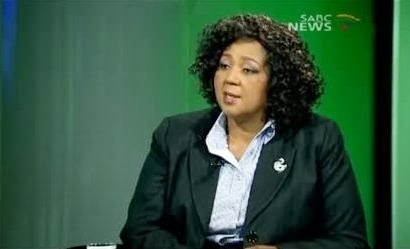 She said "SABC now is protected [sic] as competition number one for print media. And I don't know why because those things could be complimentary".